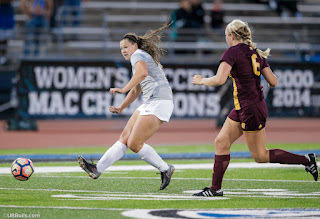 BUFFALO, N.Y. -- The University at Buffalo women's soccer team (9-4-0, 3-3-0 MAC) dropped their second straight match on Sunday afternoon as the Ohio Bobcats scored the golden goal in the 98th minute to take the 2-1 win at UB Stadium. The Bulls had their first scoring chance of the match in the sixth minute as Marcy Barberic took a nice pass from Gianna Yurchak and ripped a shot that went wide left of the Ohio goal. Buffalo was able to get on the board first in the 15th minute after they earned two straight corner kicks. Gurjeena Jandu's corner was blocked to the feet of Marcy Barberic who found Gianna Yurchak and she deposited the ball into the lower right corner of the Ohio goal for her third goal of the season. After some back-and-forth play, Marcy Barberic had a great scoring chance in the 29th minute as she ripped a shot destined for the upper left corner of the goal but the Ohio keeper made a beautiful diving stop to poke the ball out of play. In the 40th minute, Emily Kelly was asked to make her first save of the match as she grabbed the Sydney Leckie shot to preserve the 1-0 lead for UB. The Bobcats started to put some pressure on the Bulls in the second half as Abby Townsend broke in free in the 62nd minute and took a shot that just went over the crossbar. In the 83rd minute, Townsend had another great chance but she ripped the hard shot wide of the UB goal. 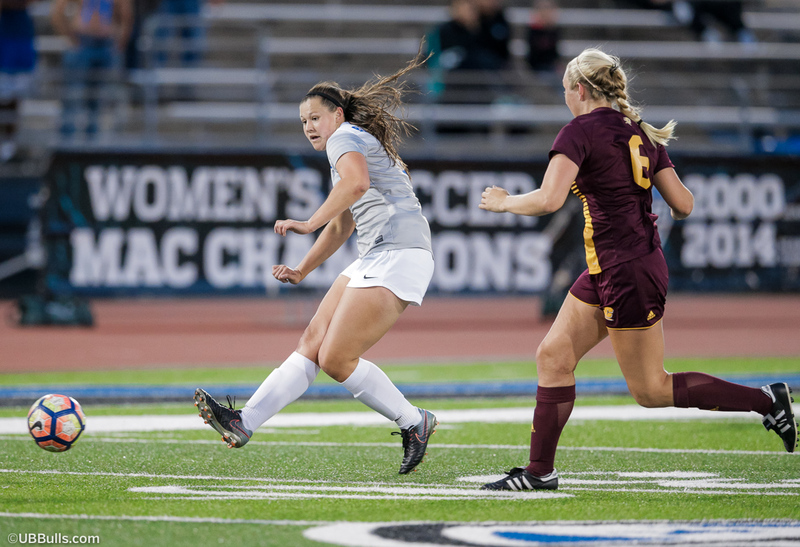 The Bobcats were able to tie the match, 1-1, in the 88th minute on a controversial play. The Bobcats appeared to be offside as Abby Townsend sent a cross to Sydney Leckie who buried her second goal of the season but it was never called and resulted in the equalizer. Both teams had chances off of corner kicks in the overtime period but the visitors were able to break through with the game-winner in the 98th minute as Alivia Milesky gathered a turnover from the Bulls and deked around Emily Kelly and netted the winner into the open net. With the loss, Buffalo has now lost back-to-back matches for the first time this season. Gianna Yurchak tied a career-high with her third goal of the season in the loss. The sophomore has now netted goals in back-to-back games for the first time in her UB career. Marcy Barberic picked up her career-high seventh assist of the season on Yurchak's goal. She has now recorded six assists in her last seven matches including assists in back-to-back games. Ohio held the 16-9 edge in shots for the match including a 10-2 edge in the second half and the 4-1 edge in overtime. Marcy Barberic and Gianna Yurchak led the Bulls with three shots each while Abby Townsend led the Bobcats with four shots in the win. In goal, Sydney Malham made two saves in the win for Ohio while Emily Kelly made three saves in the loss. The Bulls will return to the pitch on Friday afternoon as they travel to Miami (OH) for a conference matchup. First kick on Friday is set for 4:00 pm.